Customs officers kill trader during negotiation over contraband - BlogIT with OLIVIA!!! 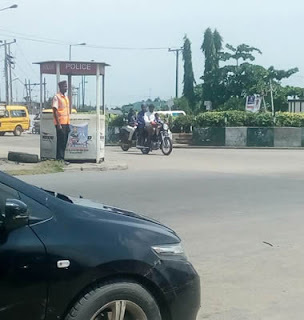 A mob went on the rampage on Wednesday after some officers of the Nigeria Customs Service allegedly killed a trader, Samuel Apase, at the Badagry Roundabout, Lagos State. PUNCH Metro learnt that the officers had intercepted Apase in the Muwo area of Badagry and seized a Toyota Camry, which he allegedly used to smuggle some bags of rice and frozen foods from Seme. The officers reportedly took the vehicle away while Apase boarded a motorcycle to trail them. He was said to have caught up with the officers at the Badagry Roundabout and pleaded to pay some money to get the car and the goods released. It was gathered that an altercation ensued while Apase was negotiating with the officers, who reportedly got enraged and opened fire on him. Punch learnt that a trader, who sold barbecued meat (suya) in the area, and a passerby, were hit by stray bullets in the process. Some Good Samaritans were said to have rushed the injured victims to the Badagry General Hospital for treatment while Apase’s corpse was deposited in the hospital’s morgue. An eyewitness, Adeleke Adesiji, said some hoodlums around the scene of the incident went on the rampage and smashed the windscreen of a patrol van used by the officers. Adesiji added that the officers later fled the scene with their vehicle and the seized car. He said, “The officers chased Apase with their vehicle to Muwo, where they collected the car from him. After they had left with the car, he followed them to the Badagry Roundabout and tried to ‘settle’ them so that he could have the car back. A resident, Oluwaseun Babalola, blamed Apase’s death on the customs officers’ recklessness, saying the deceased was not confrontational. A trader, who identified herself as Olaide, said the shooting caused panic in the neighbourhood. But the NCS spokesperson, Badagry Command, Taopeng Selchang, said some hoodlums attacked the officers and injured the patrol van’s driver while the seized goods from Apase were being taken away. He said the officers only shot into the air to disperse the hoodlums, adding that he could not confirm whether there were casualties or not. He said, “We seized contraband of about 64 cartons of frozen food products from the suspect and a quantity of rice. The suspect was intercepted along Muwo and while the officers were moving the contraband, some hoodlums ambushed them at the roundabout with cutlasses and other weapons. They attacked the officers with machetes. They also smashed the windscreen and the wing mirrors of the vehicle. “One of the hoodlums was struggling with an officer to dispossess him of his rifle when other officers shot into the air to disperse the hoodlums and ensure that the seized goods get to the command’s headquarters; there was pandemonium thereafter. The officers were only interested in bringing the contraband to the command, so they are not in a position to know whether somebody was killed or not.